Allen County-Scottsville sophomore Tad Koltin Taylor placed 35th in a field of 171 runners Saturday at the Purple Strider Invitational in Bowling Green to pace the Patriots in the annual meet. Taylor covered the 5K course in the time of 19:39.82. His time was the 24th fastest among the Kentucky schools participating in the showcase event. Taylor was 10th among the sophomores in the field. Patriot runners James Stanger, Davi Thompson, and Conner Davenport also participated in the varsity race. Stanger posted a time of 21:08.04, the second fastest time posted by a seventh grader entered in the varsity competition. Thompson finished in 21:29.11 while Davenport posted a time of 24:17.31. Two Lady Patriots took part in the girls varsity run. Gabrielle Tangen placed 40th in the 85-runner field with a time of 26:01.62 with Sally McPherson covering the course in a time of 26:51.74. The event featured a 3K event for middle school runners. Bazzell Middle School runner Sarah Davis placed 12th in the field in the time of 14:18.49. Allison Davis posted the time of 14:35.91 to place 18th in the field of 77. 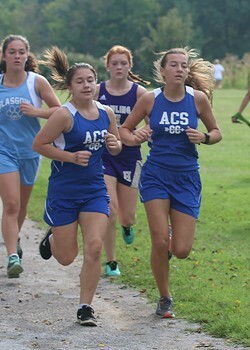 Lydia Goosetree (18:51.73) and Taylor Temple (20:37.55) also represented Bazzell in the run. Bazzell’s lone Patriot runner Seth Lutterman posted a time of 16:56.56 in the 3K. In the elementary division, Alex Stamps from the Allen County Intermediate Center covered the 2K course in 10:16.09.